A McCarren Hotel Wedding is set at what is now called the McCarren Hotel and Pool. The venue is located right on the edge of McCarren Park, and benefits from North Brooklyn’s trendy, youthful atmosphere. The space has a contemporary touch, yet it still provides the comforts and serenity expected from a boutique hotel. The hotel, often still referred to by its former title, the King and Grove Williamsburg, is a perfect urban retreat with a warm, modern aesthetic. In this photograph from a McCarren Park Wedding, the bride is having her makeup and hair done in one of the hotel’s luxury rooms. Not much is seen of the room, as the bride is the focus of the photo and of the moment. It is early in the day, with the bride at the center of the scene and her bridesmaids milling about as they prepare for the events to come. The bride smiles widely, allowing the makeup artist to power her cheeks with blush. 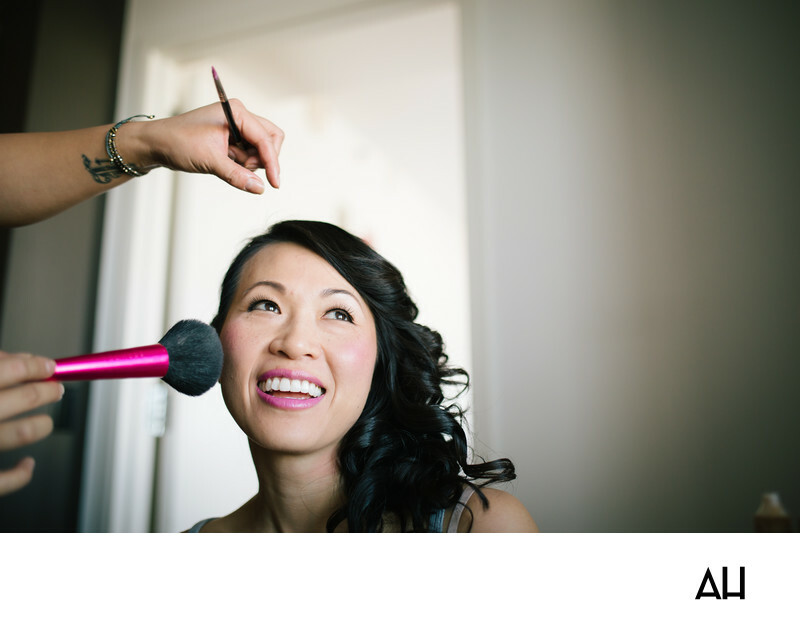 The makeup artist works carefully, but quickly, transforming the girl before her into a beaming bride. The bride’s smile in this image reaches her eyes and shines out of them, mixing with sunlight to make the whole room glow. Her makeup is done in subtle tones, only enhancing the natural beauty of the bride’s face. In a few moments she will be done being primped, and she will be helped into her wedding gown, and made ready to meet her groom and begin this new chapter of their life together.